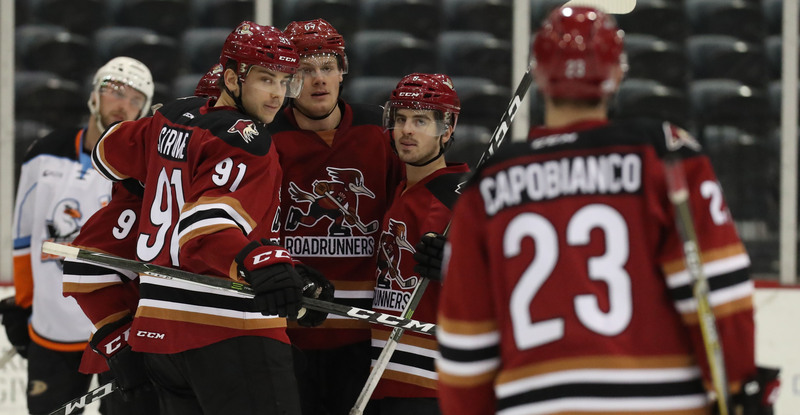 Off of yet another stellar offensive performance came the Roadrunners’ second straight win against the San Diego Gulls, topping their division counterpart by a 5-3 score Monday night at Tucson Arena. The Roadrunners have now earned points in each of their past five games played against the Gulls, posting a 4-0-0-1 mark during that span. San Diego opened the scoring with Giovanni Fiore’s goal 8:37 into the game. In the final moments of the first, the Roadrunners struck twice in a 17 second span to take a 2-1 lead into the second period. With 30 seconds left to play in the first, Dylan Strome walked out from behind San Diego’s net with the puck and beat Kevin Boyle with a shot to the short side to tie the game 1-1. Seconds later, Mike Sislo buried a pass from atop the Gulls’ crease, giving the Roadrunners their first lead of the evening with 12 seconds left in the opening frame. Just past the midway mark of the second, Lawson Crouse, stationed in front of San Diego’s net, chipped home the Roadrunners’ third goal of the evening – his first with the team since November 18. Early in the third, Crouse slid a rebound that was the product of a Kyle Capobianco point shot into the net to give the Roadrunners a 4-1 lead, scoring his second goal of the night. Dylan Strome registered assists on both of Crouse’s goals to finish the night with three points (1G, 2A). For Strome, it was his seventh game in recording three or more points, and he now has a total of 40 (17G, 23A) on the season – one shy of Chris Terry and Chris Bourque, who lead the AHL with 41 apiece. San Diego scored two goals later in the third to cut the Roadrunners’ lead to one, but Andrew Campbell found the Gulls’ empty net with four seconds left in regulation to secure the team’s 5-3 victory. Hunter Miska stopped 20 of the 23 shots he faced, earning his 11th win of the season. Joel Hanley finished the night with three assists - the first time a Roadrunners defenseman has done so this season. 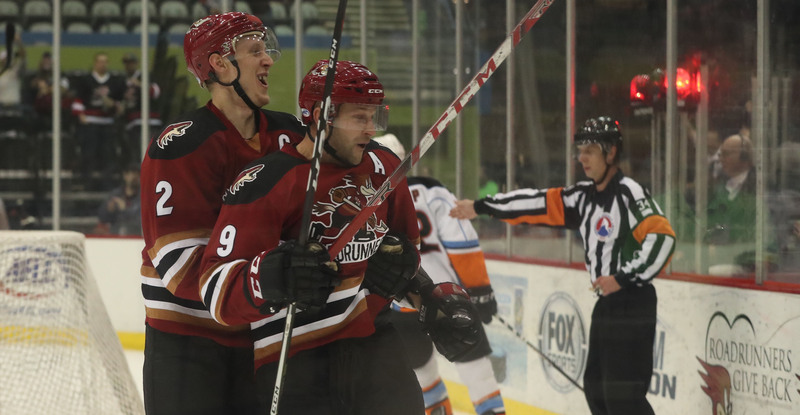 With the win, the Roadrunners’ record improves to 20-11-2-1, calculating in at a .632 win percentage, good for first place in the Pacific Division. They now lead the race for the I-8 Border Trophy by a 9-6 points count. The teams will reconvene at Tucson Arena on Wednesday morning, where the puck is scheduled to drop just after 10:00 AM.